IBM® System Storage® Gen 5 fabric backbones are among the industry's most powerful Fibre Channel switching infrastructure offerings. They provide reliable, scalable, and high-performance foundations for mission-critical storage. These fabric backbones also deliver enterprise connectivity options to add support for IBM FICON® connectivity, offering a high-performing and reliable FICON infrastructure with fast and scalable IBM System z® servers. Designed to increase business agility while providing nonstop access to information and reducing infrastructure and administrative costs, Gen 5 Fibre Channel fabric backbones deliver a new level of scalability and advanced capabilities to this robust, reliable, and high-performance technology. Although every network type has unique management requirements, most organizations face similar challenges managing their network environments. These challenges can include minimizing network downtime, reducing operational expenses, managing application service level agreements (SLAs), and providing robust security. Until now, no single tool could address these needs across different network types. To address this issue, the IBM Network Advisor management tool provides comprehensive management for data, storage, and converged networks. This single application can deliver end-to-end visibility and insight across different network types by integrating with Fabric Vision technology; it supports Fibre Channel SANs, including Gen 5 Fibre Channel platforms, IBM FICON, and IBM b-type SAN FCoE networks. In addition, this tool supports comprehensive lifecycle management capabilities across different networks through a simple, seamless user experience. 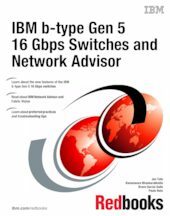 This IBM Redbooks® publication introduces the concepts, architecture, and basic implementation of Gen 5 and IBM Network Advisor. It is aimed at system administrators, and pre- and post-sales support staff.